It’s the first day of the semester at Opportunity High, and most of the school is in the auditorium, listening to Principal Trenton’s well-worn and familiar welcoming speech. Urging her students to do their best and excel both academically and personally, the principal is optimistic for a fantastic year ahead. At the conclusion of the assembly, the students get up to leave for classes, just as they normally would, only to find that nearly all the doors are locked. There is only one door unlocked, but it is being guarded by an armed student- Tyler Browne- who feels as though the whole world has turned against him. Everyone who gets in his path gets shot. Everyone who has wronged him gets shot. Even innocent kids, who have never before had any interaction with him, get shot. He is indiscriminate and impersonal, yet he has his set targets as well. 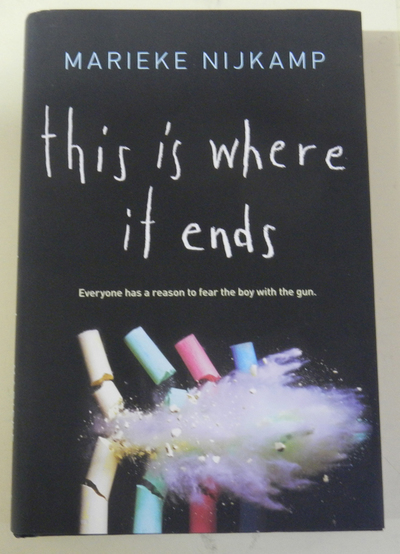 Told from the perspectives of four students- Claire, Tomás, Autumn and Sylvia- this novel follows the intense fifty-four minute siege as it happens to the students and staff of a sleepy small town high school. Each of these students has a relationship with Tyler, but this doesn’t mean that they are lesser targets to his rage and aggression. For some reason, the perpetrators of school shootings and massacres tend to follow a certain profile- they are usually quiet students, have a history of being bullied, and are ‘the last person you’d expect to do this’. In the case of this novel, most of these traits are true, however the bullied was also a bully, and a lot of the victims aren’t surprised by the violent actions taken by him to prove his point. The story is told in increments of minutes- two or three at a time- and strangely, it is easy to see how so many life-changing events can occur in such a short period of time, simultaneously, at the hands of several different people. The action is fast-paced and realistic, and the reactions are exactly as you’d expect if such a horrific situation were to play out. Social media also plays an important role in determining what is happening within the auditorium, and shows the efforts being made to rescue the school body. This is an unforgettable and emotionally-charged novel and should be read to grasp a better understanding of such senseless acts of violence.